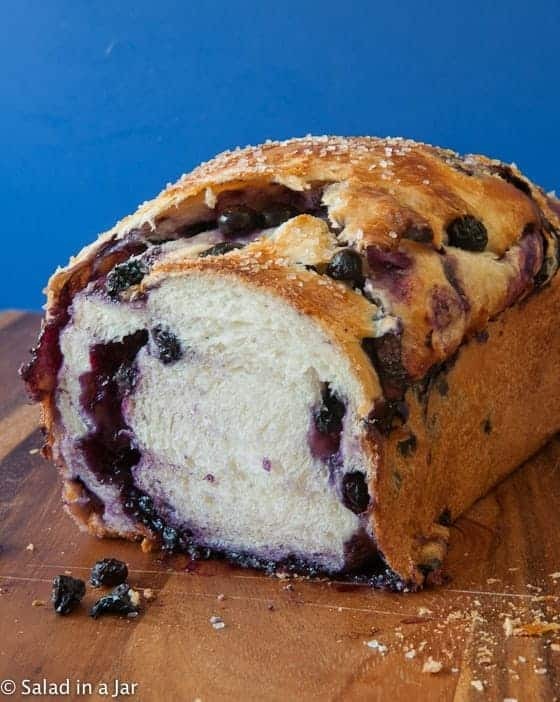 Blueberry-Stuffed Sally Lunn Bread is a brioche-like yeast bread with fresh, sweetened blueberries swirled throughout. If you don’t have a bread machine, you can make this bread with a stand mixer or by hand. 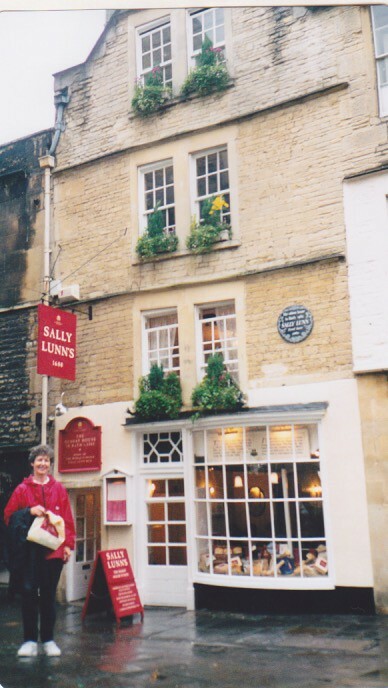 Do you know about Sally Lunn? On a recent trip to England, we got to eat Cream Tea at the Sally Lunn House in Bath. Their buns are famously light and sweet. Not only was it the most delicious bread I have ever tasted, it was also the most expensive. I went on a mission to reproduce the recipe. Not surprisingly, I’m not the first to try. However, the original recipe remains a secret to this day. It was found in the 1930’s in a previously undisclosed cupboard. 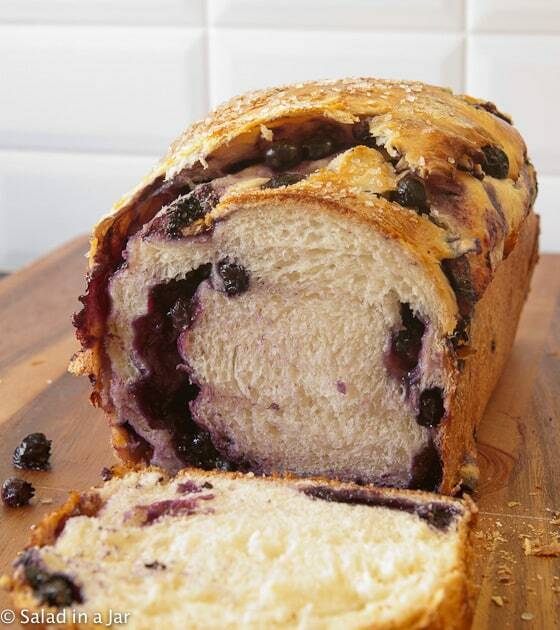 The idea of adding blueberries to Sally Lunn is inspired by a recipe for Fresh Blueberry Brioche. You can see it for yourself in Huckleberry, authored by Zoe Nathan. The problem with that recipe is all the time involved with making brioche. It’s best made over a two-day period. Thankfully, Linda Rehberg and Lois Conway have an excellent recipe for Sally Lunn in their book Bread Machine Magic Book of Helpful Hints. 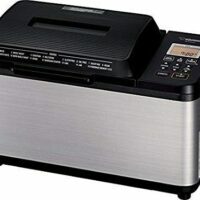 It is an essential guide for bread machine users. Consequently, I’m doing next best thing and using a recipe for brioche-like Sally Lunn. The results are spectacular if I do say so. It’s almost like eating light-as-a-feather pound cake with the freshest blueberry jelly you can imagine. Allow at least 2 hours, possibly longer, for this rise.The second rise of the loaf after you place the dough in a loaf pan will take longer than usual. The frozen blueberries in the filling will slow down the process. Granulated, sanding, or coarse sugar for sprinkling on top of loaf. Dump remaining ingredients into the bread pan of your bread machine. Select the dough cycle and press start. Open lid and check dough after about 10-15 minutes of mixing to make sure the consistency is correct. Dough should stick to the side, then pull away. If dough is too dry, add more water 1 teaspoonful at a time. If too sticky, add flour 1 tablespoon a time. When dough cycle completes and dough has risen to double its original size, remove dough to a floured surface. Press or roll dough into a rectangle roughly 10 x 16 inches. Short side should be closest to you. Scatter berries over dough, then sprinkle with 2 tablespoons sugar. Carefully roll top of dough towards you to make a cylinder. Turn cylinder of dough and reshape into an approximately 12 x 6-inch cylinder. With short end closest to you, roll dough tightly from the top. Place in greased 8 x 4-1/2 inch loaf pan. When you see the bread has almost risen enough, preheat your oven to 350 degrees F.
Whisk together ingredients for glaze in small bowl. Paint raised but unbaked loaf with a light touch so glaze won't puddle at the outer edges of the loaf. Sprinkle with plenty of sugar. I use sanding sugar but regular sugar works too. Bake at 350 degrees for 40 to 45 minutes. Watch to make sure crust doesn't overbrown before bread is done in the middle. If necessary, consider tenting loaf halfway through baking time with aluminum foil to avoid burning crust. Cool in pan about 15 minutes before removing loaf from pan to a rack to continue cooling. Best eaten after an hour but good luck getting people to wait that long. The second rise of the loaf after you place the dough in a loaf pan takes much longer than the usual bread recipe because you have used frozen blueberries in the filling. Allow at least 2 hours, possibly longer, for this rise. I am confused. Why cant you use frozen berries when youre freezing them anyway.? If you will look at the average package of frozen blueberries, they usually have extra moisture in the form of frost or icy water crystals. When you freeze them yourself right before you use them, you avoid that. Well it is outstanding! Very light texture…hoping i have enough left for french toast! Fantastic Kathy. Good to hear it! Hi Paula, from good old Bama! Yum! This looks delicious!